Remember how Sesame Street was always brought to you by a letter and a number: “This show has been brought to you by the letter H and the number 9” and throughout the show various examples of both were illustrated? 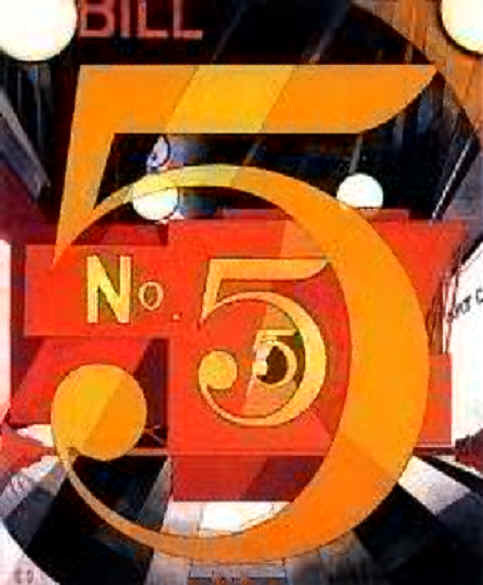 This website is brought to you by the number five. Five: it doesn’t seem like five should be any more or less important than any other number. Five — we’ve got five fingers and toes. Five: it’s four plus one or two plus three. Five — we’ve got five senses. In Taekwon-do there are five tenets, five lines of the student oath, five-colored belt levels. In the study of ki in Korea, there are considered to be only five emotions; there are five organs that correlate to those same emotions. In Eastern cultures, five is a central figure. There are considered to be five elements: wood, metal, fire, water and air. In Gung-fu, there is a five-animal system, with five animals each representing aspects of the practitioner’s character. One of the classic martial arts texts, written over 350 years ago, is a book called, “The Book of Five Rings,” by Miyamoto Musashi, a Japanese samurai. In China and Korea, the art of geomancy is a form of fortune telling using the Earth. The art, known most commonly by its Chinese name, is feng shui. This art is centered around five colors, five directions, five animals, and five types of energy. Feng shui combines religious, philosophical, astrological, cosmological, mathematical, and geographical concepts. Five appears in all major religions and philosophies as a number of sacred importance. There are five joyful mysteries, five sorrowful mysteries and five glorious mysteries in Catholicism, and five wounds of Christ’s crucifixion. There are five archangels: Michael, Seraphiel, Gabriel, Azrael, and Suriyel. In Islam, there are five pillars of faith, five categories of law. Believers pray to Mecca five times each day. To the Hindu, there are five organs of sense, five organs of action, five energies, and five steps to enlightenment. The Buddhist seeks to know the five wisdoms, the five powers and the five rites of purification. To the pagan it is the home of earth, fire, water, air and spirit. The most widely recognized Olympic symbols is that of the five interlocked rings of blue, black, red, yellow and green. It is said that the interlocking rings represent the union of the five original major continents (Africa, America, Asia, Australia, and Europe) and that the five colors were chosen because at least one of these colors can be found in the flag of every nation represented. The Pentagon in Arlington, VA is the five-sided headquarters building of the United States Department of Defense (Navy, Army, Air Force). It was designed by American architect George Bergstrom and was built in 1941. The Pentagon consists of five concentric pentagons, has five floors, five sides, and has an open central court that is five acres. Five gave us the word “punch,” as in drink. In the ancient Sanskrit language, panca means five. Panca was also the word for a refreshing drink from the East Indies, which was made by mixing five fruit juices. While most dictionaries list the origin of “punch,” as in to hit, as first appearing in Middle English and coming from the French, poinconner, perhaps the fist of five fingers also came from panca. Perhaps this is why it is written in the Taittireya Upanishad, “Whatever exists is fivefold.” There seems to be an overwhelming magic, mystery and frequency of occurrence of the number five in nature, math, science and in most major religions, philosophies, and martial arts as well. This paper will barely scratch the surface of the intrigue of five.